Vertigo glitters and glistens in your interior. Arte’s new textile wallcovering covers your walls with a cuddly, shiny fabric. The waving motions, characteristic of the so-called moiré-effect, reminds one of gentle reflections in water. 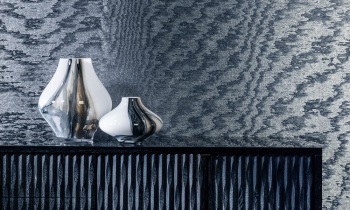 Vertigo is wallcovering with a mysterious side - each day it is different, but it is always surprising. Vertigo revolves completely around one design that was given the name Moire. 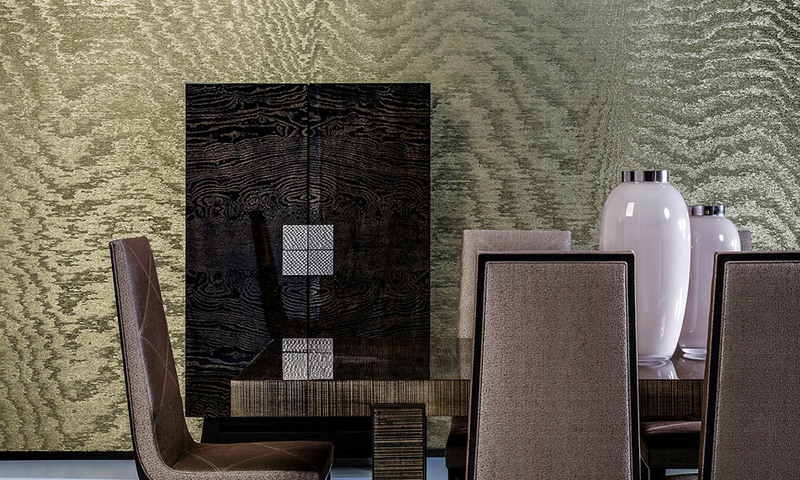 This new wallcovering was developed with high-gloss lurex fabric, a textile fibre with metal yarn. This gives it a high luxury factor. Shiny metallic colours like gold, silver and copper are real eye-catchers in an interior. Metallics can also be easily combined with other materials like wood and marble. You could say that they have a double personality. They provide a tough factor in your interior, but also inspire a feeling of luxury. In Vertigo, the metallics come in all kinds of colours: each one a shiny metallic hue with a lush appearance. Moiré?On this Lurex fabric the moiré-technique is applied. This is a crafting process by which waving, hypnotic designs arise that capture your attention. The motifs that you obtain are completely random. This makes each metre of textile unique. Thus with Vertigo you bring a very exceptional wallcovering into your home. You create, as it were, an interior of which you can never tire.